Heat oven to 350°F. Place paper baking cup in each of 12 regular-size muffin cups. Place 2 cookie dough rounds in each cup, pressing in bottom and up side to form shell. Bake 24 minutes or until golden brown (dough will puff). For each cookie cup, dip end of wooden spoon handle in sugar; carefully press into bottom of cup to reshape. Cool 5 minutes; remove from pan to cooling rack. Cool completely, about 15 minutes. In medium bowl, mix blueberries, raspberries and blackberries. Drizzle melted marmalade over fruit; stir gently to coat. 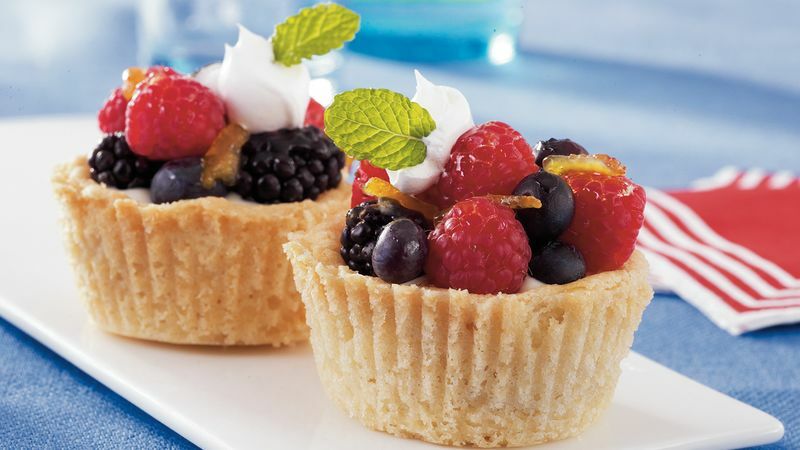 Divide fruit evenly among cookie cups. Garnish with whipped topping and mint leaves.